The sunset Wednesday evening wasn’t the most colorful one I’ve ever seen, although blue IS my favorite color. But then my two favorite feathered friends appeared. I had a stale slightly-out-of-date-but-still-delicious hamburger bun that I offered them in exchange for allowing me to use their photos on my blog. But they snubbed their beaks politely declined. Seagulls, on the contrary, never refuse anything resembling food. And, as the sun continued to set behind the clouds, a feeding frenzy ensued over a single hamburger bun. 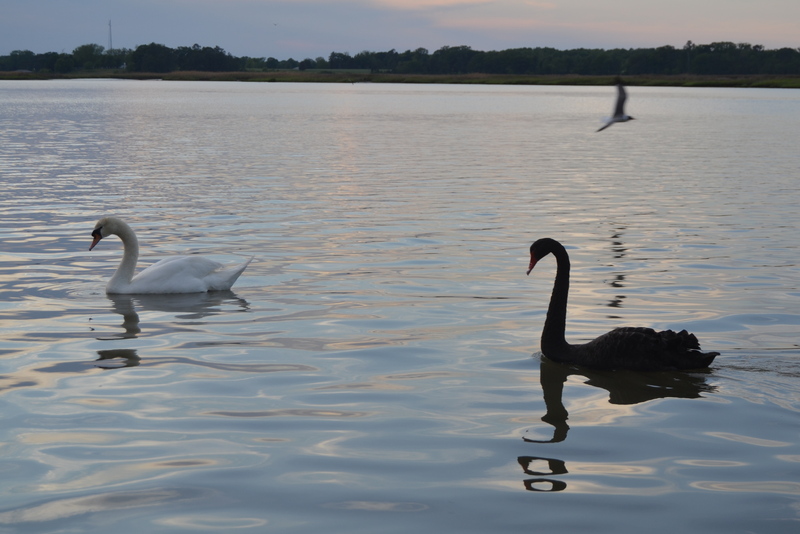 This entry was posted in Days at Home, Sunrises/Sunsets and tagged black swan, seagulls, sunset, white swan. Bookmark the permalink. Blue is a great favorite color and these are beautifully done. thank you for sharing. 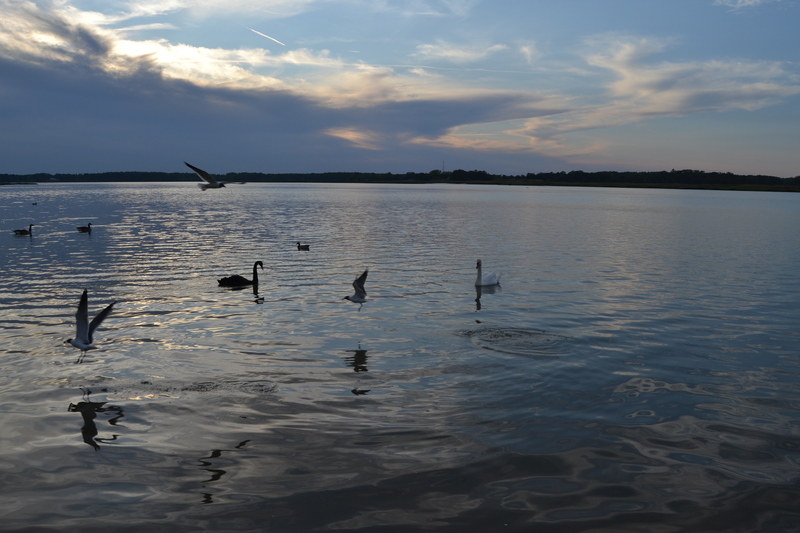 Kind of gives a new slant on the “one man’s trash is another man’s treasure” saying…this time it’s “one swan’s snub is another gull’s dinner!”……..lovely blue sunset. What beautiful photos! The bride and groom swan just don’t know what they were missing! These are stunning. I love the blues. I can’t help love any photo with Bride and Groom Swans in them. Those dusk to sunset blues are my husband’s absolute favorite colors. 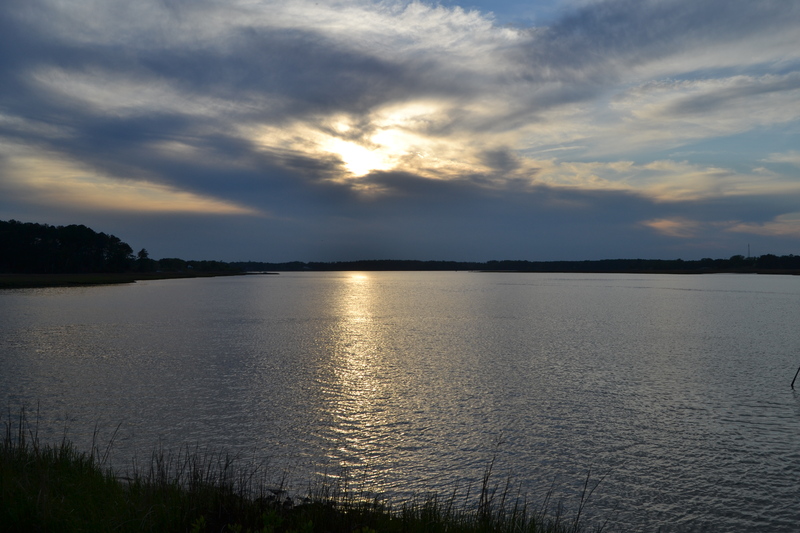 I love how the water caught glimpses of the sunset’s shades that weren’t obvious just looking at the sky. Love the flurry of activity in the last one too! Bride and Groom swan were too busy admiring the sunset to accept the ‘slightly out of date’ bun. But I’ve never known a seagull to refuse anything resembling food! They refused your hamburger bun! It is still a gorgeous sunset! Any sunset over water is awesome! seagulls are so hilarious when they go ballistic over food. Liked the sunset even though it didn’t have the usual reds and oranges. still so pretty on the water. the glassy ripples are wonderful! What a beautiful sunset. You caught the image perfectly. 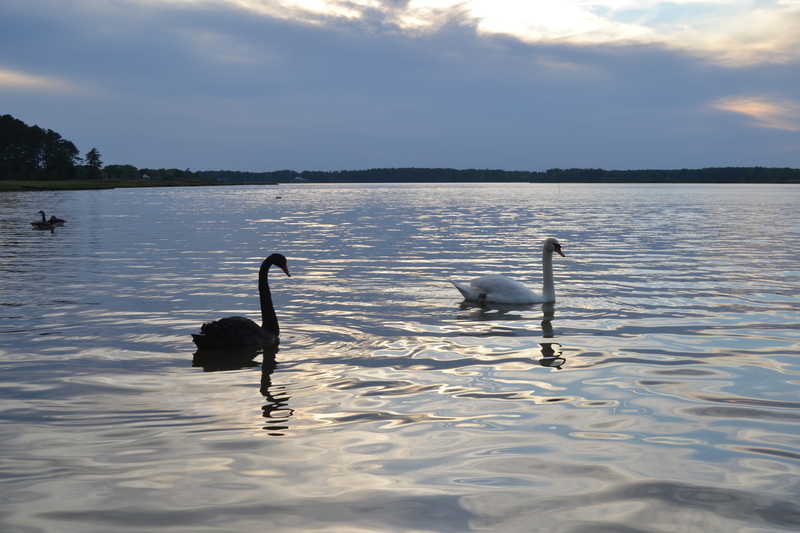 Only the swans can snub their beaks and still appear gracious. Love your witty banter about them and the ‘study in blue’. Nice. There is a lot of blue in these. You really created a stir with that stale bread!